With the wintery cold setting in, I find myself eating a lot of pasta and a lot of soup. I look towards warming foods that fill the belly and satisfy with rich flavors and textures. 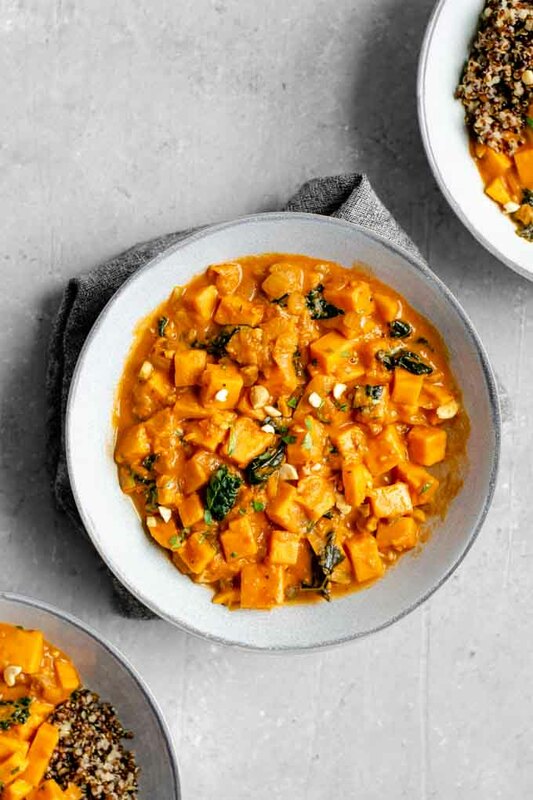 It’s even better when they’re filled with good for you wholesome ingredients like this curry sweet potato, kale, and peanut stew! This hearty, stick-to-the-ribs stew is inspired by the West African maafe with a definite American twist to it. Maafe, or groundnut stew, is a popular dish originating in Mali with variations across West and Central Africa. It’s base is made of groundnuts (peanuts) and tomato, and typically stuffed with meat, and commonly served or made with sweet potato. It’s a pantry friendly recipe, easy to make, and comes together fairly quickly as well. Traditionally it’s served alongside rice, millet, or couscous, but I went for something atypical and paired it with quinoa. And I have to say it’s fantastic that way! As a bonus, quinoa adds extra protein and nutrition to this already perfect recipe. The base of the soup is peanuts and tomato, and I take a few shortcuts to make this extra easy. The first is to use peanut butter (creamy or chunky works! ), it thickens and enriches the base to make a creamy broth. Along with the peanut butter, I like to add chopped peanuts towards the end. 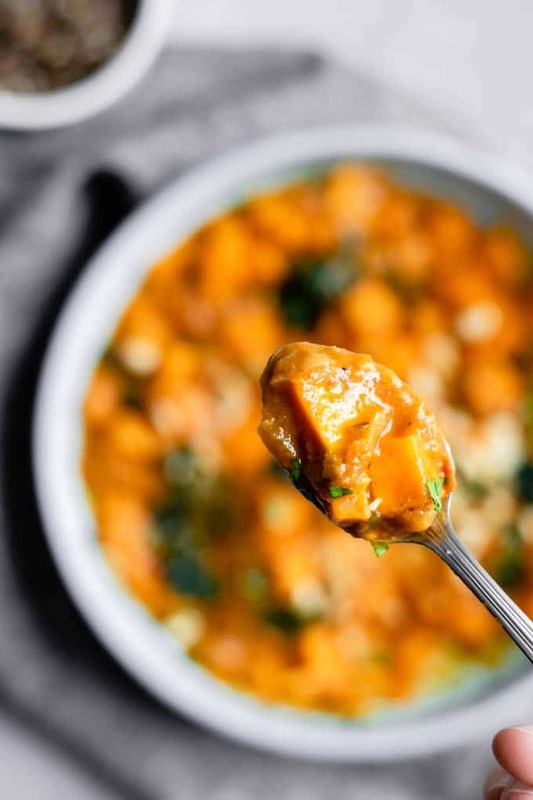 The chopped peanuts add a nice textural contrast to the buttery sweet potato and creamy stew. 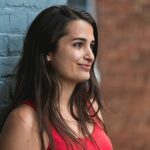 You can use either dry roasted (ideally unsalted) or un-roasted peanuts for this recipe, but I do enjoy the extra flavor of the roasted peanuts! As for the tomatoes, I like to use canned tomatoes. They’re equally good year round and you can guarantee delicious tomatoey flavor by buying from high quality brands. Crushed, diced, or whole tomatoes work, but if using whole you’ll need to chop them, crush them in your hands (be careful of squirting! ), or pulse in a blender before adding. Onion, garlic, and hot chilies provide the base of flavor for the soup, and sweet potato makes up the main bulk of it. The spices for this recipe are inspired by a mix of Indian and Mediterranean. Curry powder is a common spice mix added to West African peanut stew, and I’ve made this with both a store bought Madras curry powder, a homemade Indian curry powder, and my Jamaican curry powder found in this Jamaican recipe. It’s been delicious with each of these spice blends, so definitely feel free to use what you have and experiment! Next comes the dried and ground peppers. I like to use a mix of smoked paprika and cayenne. For the smoked paprika, if you like things to have a kick I recommend using hot smoked paprika. Otherwise, use sweet smoked paprika for a milder stew. And, because I find that this sweet potato stuffed stew can take a lot of heat, I add cayenne on top of the fresh chiles and hot smoked paprika. Even with these 3 spicy ingredients, I did not find this stew to top a medium heat. However, if you’re sensitive to spice, you’re going to want to seed your chiles, use sweet smoked paprika, and cut back to a pinch of cayenne (or skip it altogether). If you’re my husband, you’ll just top your stew with extra cayenne to serve! So that’s cool too! These spices are combined with fresh thyme for a burst of minty, lemony freshness. You can substitute dried, but fresh has better flavor that really pops in this recipe. 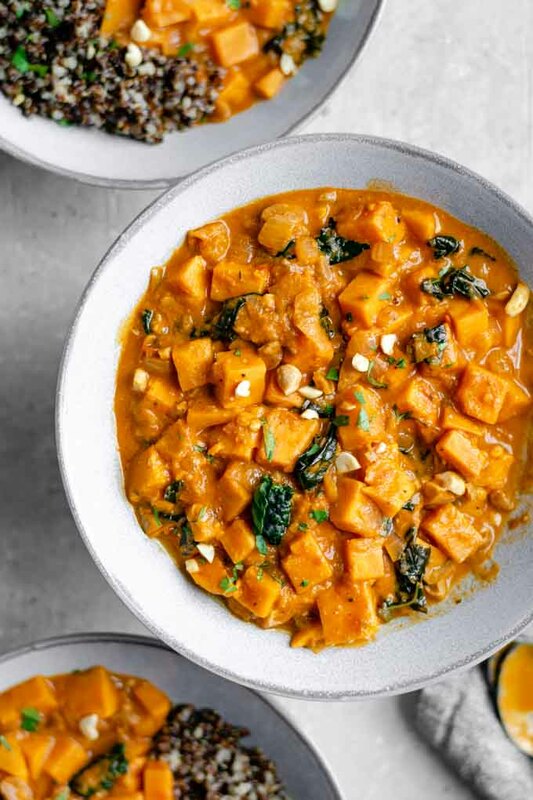 Sweet potato pairs really well with the slightly bitter, earthy flavors of dark green vegetables. I like to add chopped kale to this stew to balance the flavors and add a bit of extra nutrition. I’ve also made the recipe with broccoli and it’s great that way, and collard greens, spinach, or chard would also make a great addition. This recipe couldn’t be easier. First chop your vegetables and have them ready to go. Then, heat a bit of oil in a large pot, add the onion, garlic, and chili and cook them to soften but not caramelize or brown. Add the sweet potato and let it pick up a bit of color before adding the spices. Give the spices 30-60 seconds to activate their flavors in the oil before adding the water and tomatoes. 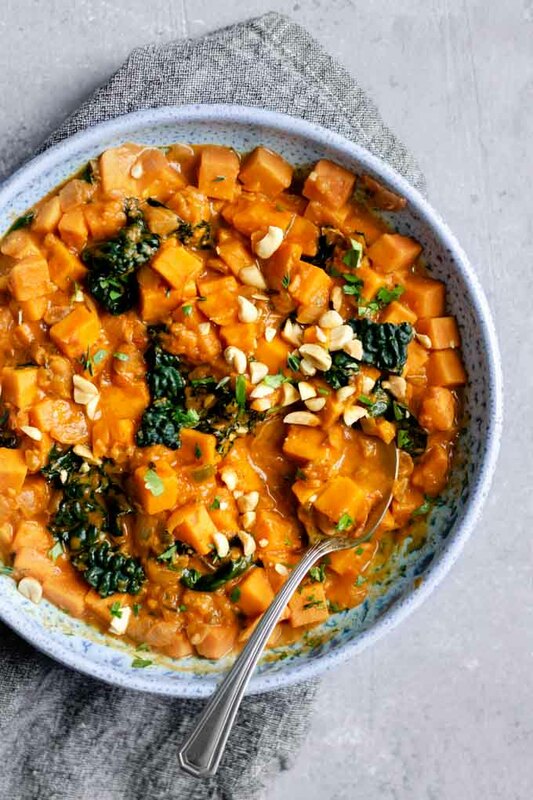 Cook until the sweet potatoes are just tender, stirring in the peanut butter and chopped peanuts halfway through. 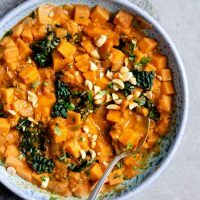 Once the sweet potatoes are easily pierced with a fork (but not falling apart or mushy) add the kale, or whichever green veggie you’re using. Let the greens soften and cook another few minutes, then the soup is ready! Remove the sprigs of thyme and serve with the grain of your choice. Top with chopped peanuts for garnish, along with cilantro (or parsley) and extra fresh thyme. This is a stew you’ll find yourself coming back to over and over again. It makes a lot, is quite low calorie for how filling it is, and is just addictively good! Feel free to tinker with this recipe to make it your own. On one occasion I made it with 1 sweet potato and several carrots as that is what I had on hand, and it was excellent that way! If you’re allergic to peanuts, try it with almond butter and chopped almonds, or cashews and cashew butter, or try sunbutter and sunflower seeds or pepitas. I do hope you guys enjoy this stew as much as we do! But seriously, what’s not to love! You have sweet potatoes, kale, curry, and peanuts all in one delicious recipe. 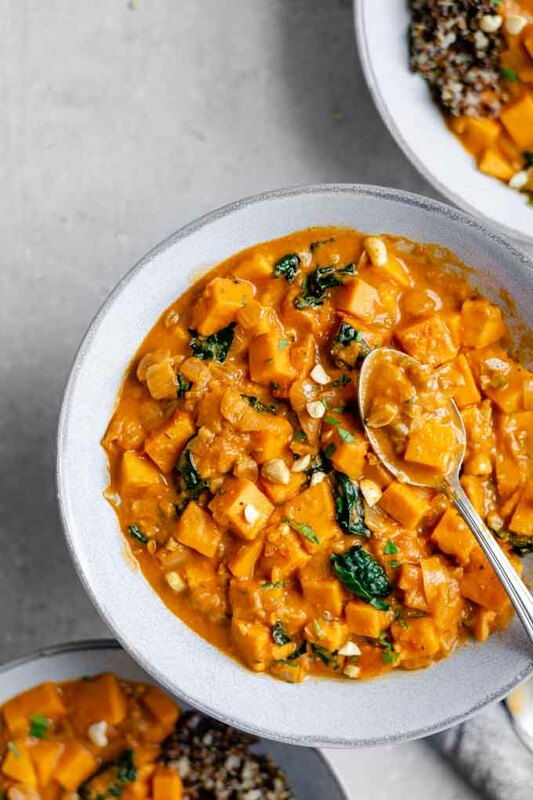 If you make this curry sweet potato, kale, and peanut stew, leave a comment below and rate the recipe on the recipe card. And please share your photos with me on Instagram, tag @thecuriouschickpea and #thecuriouschickpea, I love seeing your creations! A hearty stew inspired by the West African dish maafe. 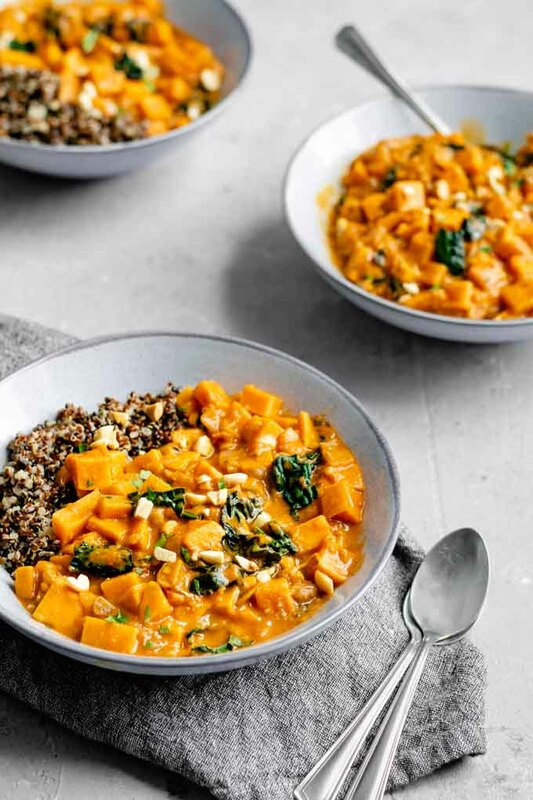 It's a creamy, nutty stew stuffed with sweet potato and kale for a healthy and filling vegan and gluten free meal! Heat the oil in a large stock pot over medium heat. When hot add the onion, garlic, and chili and cook until softened, about 5 minutes. Add the sweet potato and sauté for 3-4 minutes to give the potatoes a little color. Add the 1 tsp of salt and freshly ground black pepper, curry powder, smoked paprika, cayenne, and fresh thyme, stir and let cook for 1 minute. Add the water and tomatoes, cover the pot and bring to a boil. Turn the heat down and simmer for 5 minutes before adding the chopped peanuts and peanut butter. Stir to dissolve the peanut butter, then simmer another 2-3 minutes or until the sweet potatoes are just barely fork tender. Add the chopped kale and cook until just tender, 2-3 minutes. Serve topped with cilantro or another fresh herb for garnish and quinoa or rice. Substitute another leafy green for the kale (collards, spinach, etc) or choose a different green vegetable like broccoli. Just finished eating two big servings of this fantastic recipe. So easy and reminds me of one of my favorite Thai curries (absent the coconut milk). This one is going on repeat! This tastes extremely delicious!!! It’s easy to make and definitely wworth every minute you spend preparing it!